Medical Conditions Andrea had severe emotional and behavorial problems at the time of her 1993 disappearance. Distinguishing Characteristics Caucasian female. Brown hair, brown eyes. Andrea has a scar on the left side of her forehead, near her hairline. 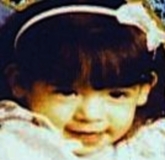 At the time of her disappearance, Andrea was living with her father, Paul M. Gonzalez Jr., and stepmother, Kim Sherrie Williams Gonzalez, who was pregnant. Prior to moving in with them, she had lived in Illinois with her biological mother, Michelle Gonzalez, and in various foster homes under the auspices of the Illinois Department of Children and Family Services (DCFS) after her mother was incarcerated for perjury. Andrea's foster parents stated she was suffering from stomach parasites when she went into their care, frequently used profanity, and had tantrums and violent outbursts. They believed she had been sexually abused, but this was never confirmed and Michelle denies it. Michelle repeatedly missed her visitation periods with her daughter after she was released from prison, so the DCFS asked Paul if he wanted to take custody of Andrea. He agreed. Andrea moved to Alabama to be with her father and stepmother in early 1993. Michelle's other two children were placed for adoption. Paul and Kim reported Andrea as a missing child on November 20, 1993. They said she disappeared from the family's trailer in the middle of the night. There were no signs of forced entry to the home, but the Gonzalezes stated the trailer was an old one and its locks could have been picked easily. Andrea has never been heard from again. An extensive search of the area turned up no indication of her whereabouts, and bloodhounds could only track her scent as far as the front porch. Her father and stepmother initially suggested her mother had taken her, but Michelle was later located and did not have the child. She is not considered a suspect in her daughter's disappearance. Paul passed a lie detector test about the case, but Kim failed hers. She initially blamed the failure on stress and her pregnancy. Authorities quickly came to believe that Kim was involved in Andrea's disappearance, because she kept referring to her stepdaughter in the past tense. On February 13, 1995, over a year later, Kim voluntarily went to the police and confessed to causing Andrea's death. She claimed she had accidentally scaled the child while bathing her. Kim said she treated Andrea's burns with burn cream and Tylenol pain medication and put her to bed, and several hours later she found her deceased. Kim stated that she panicked afterwards, wrapped the body in plastic garbage bags, tied it to a concrete block with a length of electrical cord, and dropped it off the Mon Dye Bridge into Upper Bear Creek Lake in northwest Alabama. An extensive search of the lake turned up two trash bags and one concrete block, but no sign of Andrea. Paul at first claimed he had been asleep when Kim bathed Andrea and he woke up to find his daughter missing, but he later admitted that he helped his wife dispose of the child's body. Police did not think Andrea's death was accidental, however; they believed she had been deliberately abused and murdered. First Kim and then Paul were charged with capital murder. Both of them could have faced the death penalty if convicted. Prosecutors argued that the Gonzalezes effectively murdered Andrea by withholding medical treatment from her after her scalding, but without Andrea's body, there was not enough evidence to convict either defendant of murder. Paul pleaded guilty to manslaughter in Andrea's case and testified against Kim at her trial. He was sentenced to ten years in prison, served only two, and was released in September 1997. He said he was asleep at the time of Andrea's scalding and death, but admitted to helping dispose of the body. At Kim's trial, her attorneys argued Paul was domineering and abusive and that it was he, not Kim, who killed Andrea. Kim was found not guilty of murder and guilty of child abuse in 1997. She was released from prison in 2001. Paul reportedly now lives in Texas and Kim is still somewhere in Alabama. Some people theorize Andrea was never killed at all but was sold and is alive somewhere, but authorities believe she is deceased. Investigators have continued to look for Andrea's body over the years. The latest search, in a cellar in Muscle Shoals, Alabama, turned up no evidence. Andrea formerly resided in Galesburg and Peoria, Illinois. She has never been located. Updated 6 times since October 12, 2004. Last updated October 7, 2010; middle initial and date of birth added.